Definition at line 187 of file util-decode-mime.h. Definition at line 206 of file util-decode-mime.h. Referenced by MimeDecAddEntity(), MimeDecParseFullMsg(), SMTPParserCleanup(), and SMTPProcessDataChunk(). Definition at line 207 of file util-decode-mime.h. Definition at line 197 of file util-decode-mime.h. Definition at line 196 of file util-decode-mime.h. Definition at line 208 of file util-decode-mime.h. Referenced by MimeDecAddEntity(), MimeDecParseFullMsg(), and MimeDecParseLine(). Definition at line 209 of file util-decode-mime.h. Referenced by LiveDeviceListClean(), MimeDecInitParser(), MimeDecParseFullMsg(), SMTPParserCleanup(), and SMTPProcessDataChunk(). Definition at line 198 of file util-decode-mime.h. Definition at line 204 of file util-decode-mime.h. Definition at line 210 of file util-decode-mime.h. Referenced by MimeDecAddEntity(), and MimeDecInitParser(). Definition at line 205 of file util-decode-mime.h. Definition at line 191 of file util-decode-mime.h. Definition at line 190 of file util-decode-mime.h. Referenced by MimeDecAddEntity(), and MimeDecDeInitParser(). Definition at line 193 of file util-decode-mime.h. Definition at line 192 of file util-decode-mime.h. Definition at line 194 of file util-decode-mime.h. Definition at line 195 of file util-decode-mime.h. Definition at line 188 of file util-decode-mime.h. 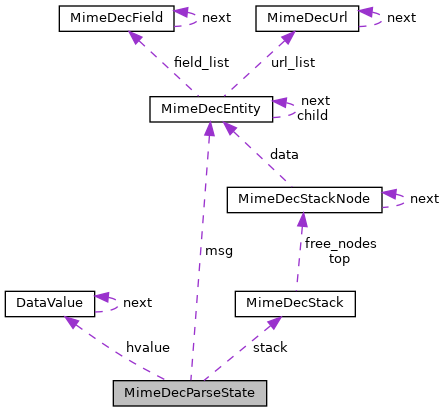 Referenced by MimeDecAddEntity(), MimeDecDeInitParser(), MimeDecInitParser(), MimeDecParseComplete(), MimeDecParseFullMsg(), MimeDecParseStateGetStatus(), and SMTPProcessDataChunk(). Definition at line 189 of file util-decode-mime.h. Referenced by MimeDecAddEntity(), MimeDecDeInitParser(), MimeDecInitParser(), MimeDecParseComplete(), MimeDecParseStateGetStatus(), SMTPParserCleanup(), and SMTPProcessDataChunk(). Definition at line 203 of file util-decode-mime.h. Referenced by MimeDecAddEntity(), MimeDecInitParser(), MimeDecParseComplete(), MimeDecParseLine(), MimeDecParseStateGetStatus(), and SMTPProcessDataChunk().